The first students to take a degree in surfing in the UK have officially graduated. They took to the waves as part of their course at Plymouth University which began three years ago. 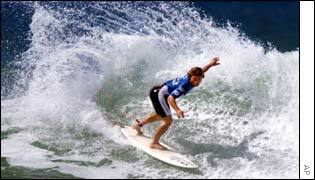 The university is within easy reach of Cornwall's popular surfing beaches. In 1999 the course - in Surf Science and Technology - had just 16 places, but growing demand has seen numbers rise to 55 students a year. The degree is not just about riding waves , it concentrates on the study of the scientific, technical and business aspects of the international surfing industries. Some of the new graduates have gone on to work in the surfing industry. Jim Edmundson graduated from the course and now works in marketing for Gul International, a wetsuit manufacturer. He said: "The degree was far from an easy ride. "Our tutors made science really interesting because it was slanted towards surfing, and the programme was diverse, exploring the whole of the surfing industry." The surfing degree course - a BSc - was dismissed as "silly" last year by the former Chief Inspector of schools, Chris Woodhead. He said it was not a genuine academic discipline. But it was backed by the head of the body which represents Britain's university vice-chancellors, Professor Roderick Floud. At the time, Mr Floud said: "A degree in surf science and technology - is this a silly degree? "Of course not, it was launched because of demand by local employers in Plymouth for the graduates it delivers." Plymouth University said the course was scientifically rigorous and candidates needed at least a grade C at A-Level in physics, chemistry or maths. The surf science students were among 2,000 Plymouth University graduates to receive their degrees this week.